GECHTER GmbH is a familyrun, midsize business with increasingly international orientation. All GECHTER presses, GECHTER controls, and GECHTER special machines are the result of many years’ experience and continuous advancement. The close and focussed cooperation of all the departments and divisions involved in the development and manufacturing of the GECHTER products leads to future-oriented and hands-on solutions. 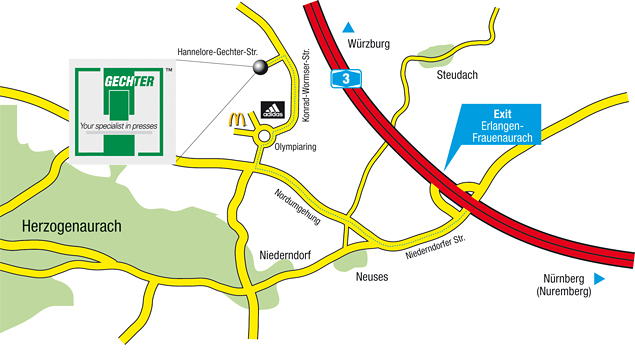 Our products are developed and produced at our factory in Herzogenaurach to meet our customers’ quality standards. If you are looking for a safe and smooth manufacturing process, the GECHTER technology will provide the best prerequisites for it. What`s more, we will plan and implement all-in-one solutions for you, customized to your individual needs. After all, the GECHTER staff consists of highly qualified specialists who are experts in their field and who can rely on the experience of everyone at GECHTER. You would like to know which of our standard or special machinery solution would best suit your needs? Don’t hesitate to ask, we will be glad to advise you! Many innovative GECHTER solutions are being used worldwide. We know what is required to make production processes effi cient, and therefore put the vast range of GECHTER products at your disposal. Our new safety and control technologies in particular, like the MS00, prove the high performance standard of the GECHTER control technology. If you produce in compliance with he ISO standard, you will be well-equipped with GECHTER products.The following catalog pages provide you with detailed information on the complete range of GECHTER products. Please don’t hesitate to contact our sales staff and consultants. Just phone in and find out. We will be there for you.